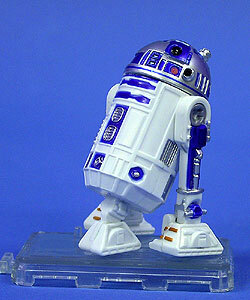 Note: This figure is the based on the R2-D2 (Naboo Escape) figure from the 2000 Power of the Jedi line. Comments: Princess Leia hides information about the Empire's latest weapon in the memory system of the resourceful, spunky and adventurous R2-D2, just before the consular ship they are on is captured by Imperial forces. She tasks R2-D2 to continue her mission to contact the long-lost Jedi Knight and Republic General, Obi-Wan Kenobi. Commandeering an escape pod, R2-D2 and C-3PO rocket away from the captured consular ship and crash-land on Tatooine.